Industrial O'm are a robotics megacorp and a major faction in the Theta wars. It is difficult to pinpoint the time when Industrial O'm was founded, however there are rumours that they date back to the early 1900s in some form as their name is scantly mentioned in scattered sources. The name Industrial O'm was made famous in China in 2088 with the release of their Giles U11 Mk 2 robot; capable of performing all tasks relating to primary industry reliably and efficiently at a low price. Within a few years these 'farmer bots' and subsequent low-cost upgrades had replaced humans in all but the supervisory aspects of primary industry. By 2110, all skilled and unskilled industry in China and a large portion of it in South Asia was dominated by the robots of Industrial O'm. This caused the citizens of these countries to become truly free people with no need for occupation or strife, and were free to amuse themselves with purely leisurely activities. In this year, Industrial O'm used its robots to turn upon the Chinese government and seize it for themselves. With no army or civil police to resist, the corrupt government of China was pushed over and replaced overnight with the Industocracy, headed by Chairman Shumyenka. The Industocracy bled southwards and seized much of Indo-China, screeching to a halt just past the Indian border where they had no presence on account of mysteriously banning Industrial O'm products when they were first available. The Industrial O'm empire, known as the Industocracy spans most of South and East Asia, stopping within India and partway through Russia and old soviet states. These lands were acquired by saturating the workforces of these areas with Industrial O'm Robotic products and later using them to seize control of local governments, which in turn added themselves to Industrial O'm's superstate. Their influence stops at Siberia and pat way through old Soviet states, due to there being too little industry for them to take over which they could use to seize power. Borders come to an abrupt halt at the Indian border and Australian influenced land as Industrial O'm produces were for some reason banned upon their introduction, though some surrounded areas have been taken by force. Finally, their control extends over seas south of China, but not west, as Japan too have outlawed Industrial O'm products when they anticipated this sort of imperialism. Industrial O'm is the consummate megacorp. Their focus is any kind of technology and their specialty is robotics and artificial intelligence, and thusly, these are their main exports. Within the Industocracy, they control any kind of industry and product. All food, clothing, furniture, housing, services… everything is provided by Industrial O'm and created by their robots. All maintenance on robots is performed by robots. This means that the only manpower required by Industrial O'm is in R&D and business management, which is where most of the learned population of the Industocracy work in, and even this work is light. This means that most of the population are free to pursue whatever other activities they please, be it leisure, learning, sporting or standing on their heads singing TV theme songs. Industrial O'm's foremost products are their exceptional Robotics, which now perform every task, skilled or not. They employ a plethora of different droids for any and every purpose, from housework tasks and cocktail waiting to running power plants and executing space shuttle launches. These are readily available and extremely cheap within the Industocracy. In other lands, no one can deny the utility of these machines, but legislation is tight lest their country becomes assimilated into Industrial O'm's empire. In America for example, intelligent robots are only permitted for performing menial tasks only and are limited by taxes. In commonwealth countries restrictions are prohibitively tight, but are only totally banned in India and Australia. This means that there is a lot of money to be made on black market Industrial O'm products world-wide, a market which they exploit thoroughly. The basis of Industrial O'm's philosophy is that tools and machines are an extension of oneself, both physically and spiritually. When you use a screwdriver, you become the screwdriver, and the screwdriver becomes you, and so on. This enforces a dogma that people are one with the things they use, and through this fusion of man and his tools anything can be made or obtained. While there are no religious restrictions or requirements in the Industocracy, this sort of philosophy is hammered into all citizens from an early age. The Industocracy is always at odds with India, Australia and Russia, and fights on-off wars with Japan. In the past, other nations have tried to take a piece of it, but they have been unsuccessful in doing any real damage. Industrial O'm owes its stalwartness wholly to its mastery of technological advancement. Their high technology provides them with superior weapons and defences, all wielded and manned by expendable, reliable robotic soldiers. The Industocracy makes frequent use of Orbital Phase Cannons to attack guarded ground sites and to shoot missile out of the air with pinpoint accuracy. Industrial O'M has thrived because it has its fingers in many pies. The secret societies it seeks to control are Interest 9 and The Brotherhood. IOM's high technology and dependence upon machinery makes the industocracy THE place to be for anyone with anything to do with technology, and as a result over half of Interest 9's membership lie there. IOM openly denounce both magick and Xenoforms, believing their man-made technology is the only magick the human race needs. Like all theta factions, they attempt to manipulate Hugh Charlesworthy, who is a serious thorn in IOM's side. He is most often directed against suspected machinations of the Alpha Machine and Chrono Force Elite who are the biggest threats to IOM's security. He is also pointed towards HACS often, but for unknown reasons, Hugh has yet to take the bait against them. Here follows a list of Industrial O'm's rivals in the Theta Wars and their relationships. Time Nazis: Though they are good customers, IOM squirm at the Zeitkommando's extensive abuse of occultism and interpretation of the brotherhood's creed. The Time Nazis strip down the AI of each product they buy and reprogram them with their own, much to the ire of IOM. Chrono Force Elite: IOM is very much at odds with CFE and the rest of America due to its boisterous political positions. The American forces and CFE make frequent attacks on The Industocracy to little avail and largely try to destroy them where they are found. These feelings are reciprocated by IOM. 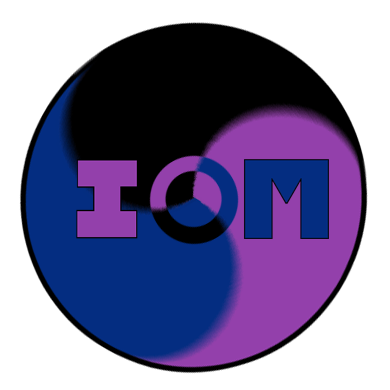 Alpha Machine: Though an insidious secret society, IOM is somewhat aware of AM's motives and presence but is frequently infuriated by the fact that they cannot be found, and they have a handful of technologies that they cannot master. Any research on these technologies is mysteriously and brutally sabotaged. The Master Church: Where the borders of the Industocracy end, the vague borders of the Middle East and the Master Church's influence begin. The somewhat ascetic nature of the church hampers sales made to them and hence their expansion, but otherwise TMC and IOM rarely collide. N: A close and impenetrable group, N wield bizarre and advanced technology which cannot be reverse engineered. Their disgusting flaunting of magic and mysticism in combination with this technology is considered an affront to the noble causes of Interest 9 and rubs against their brotherhood beliefs. Hiroshima Aruki Chrono Soldiers (HACS): Though not a theta faction, HACS seem determined to crush and destroy IOM by kicking the supports out from under it in the interests of 'liberating' China. Time agent Kaori Tamakeri has done more to hamper IOM by sneaking around in their bases than the armed incursions of Chrono Force Elite and SS Zeitkommando. Department T of British Military Intelligence: Enemy of all Theta Factions, Dept. T frequently attack Industrial O'M, but can always be thrown off by the slightest implication of Time Nazi's involvement. Sergeant Charlie Thunder has ruined many an IOM project in his time.